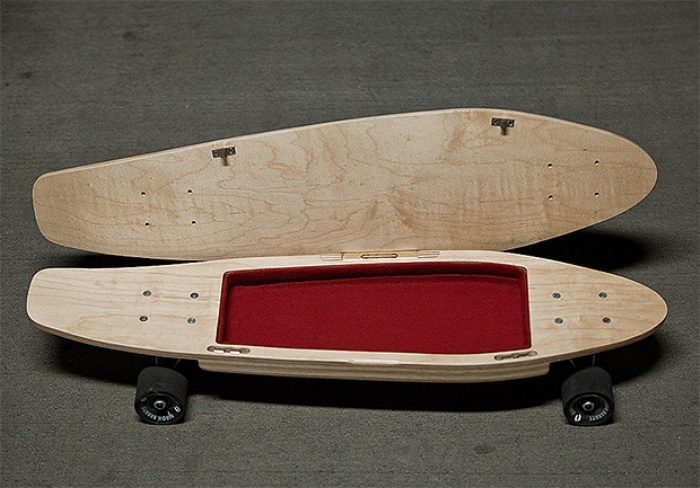 BriefSkate is a Skateboard With a Hidden Compartment | OhGizmo! By Hazel Chua on 01/03/14 • Leave a comment! Bikes have their baskets and motorcycles have their trunks. But what about skateboards? Most conventional boards don’t have an extra compartment where you can stash some spare cash or other essential stuff, but the BriefSkate does. Its name is a play on briefcase, which is kind of apt because the way the skateboard opens to reveal a hidden compartment is kind of like how a briefcase opens. The added weight might slow you down so make sure you keep that spare change elsewhere. The team behind the BriefSkate will be launching a campaign on Kickstarter soon. You can sign up for alerts on their website here.